Gillis remarked on the changes in mentality of film productions: “preproduction schedules are getting shorter, and we’re expected to produce these creatures faster and faster. But artists can’t perform at top speed all the time. The constant demand to do everything quicker tends to burn people out. And in this digital age, with so much wonderful stuff possible on the computer, we can’t afford sloppy work. 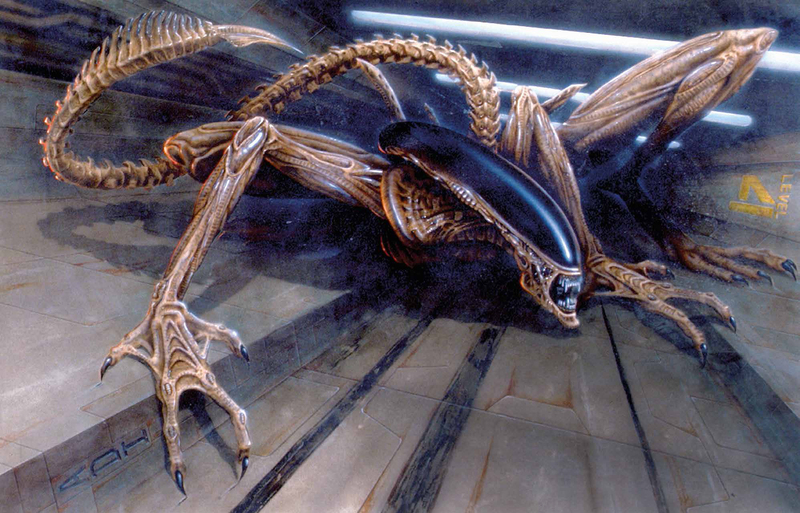 If we drop the ball, it looks bad for our art.” Alien: Resurrection was, at the time, the largest special effects project for which ADI was ever hired, and to accommodate the gargantuan body of work, the company had to move to a larger workspace and hire new crewmembers (arriving to a total of 70). Hive concept art by Sylvain Despretz. 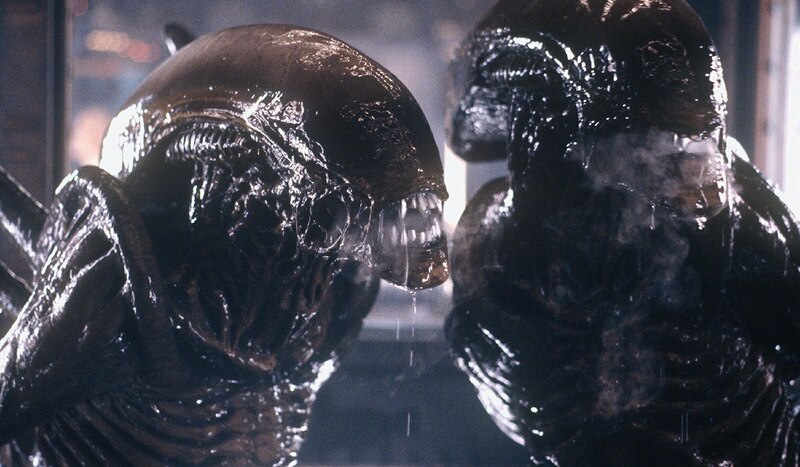 The mutation influenced the secreted Alien hive material, which looked different when compared to the precedent iteration, seen in Aliens. Foam latex and silicone were used to create the new hive and cocoons. During the underwater chase, the survivors stumble upon a placenta-esque membrane, brought to the screen as a thin silicone layer. The Viper Pit being built. The Viper Pit scene, intended as an homage to Giger, replaced an otherwise undescribed action scene in the original script. 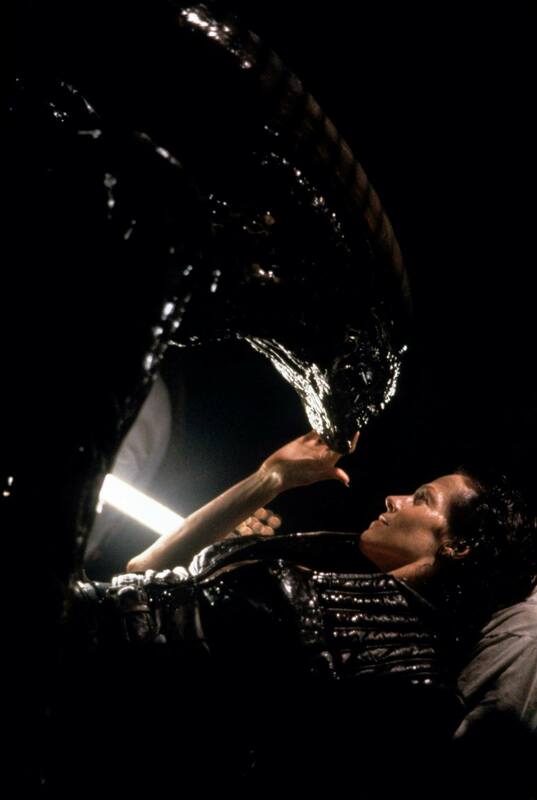 The director, however, wanted the scene to have a different vibe than originally intended, and end in the “poetic” image of Ripley 8 being carried by an Alien. Jeunet recalled: “it was an opportunity to make a homage to Giger. 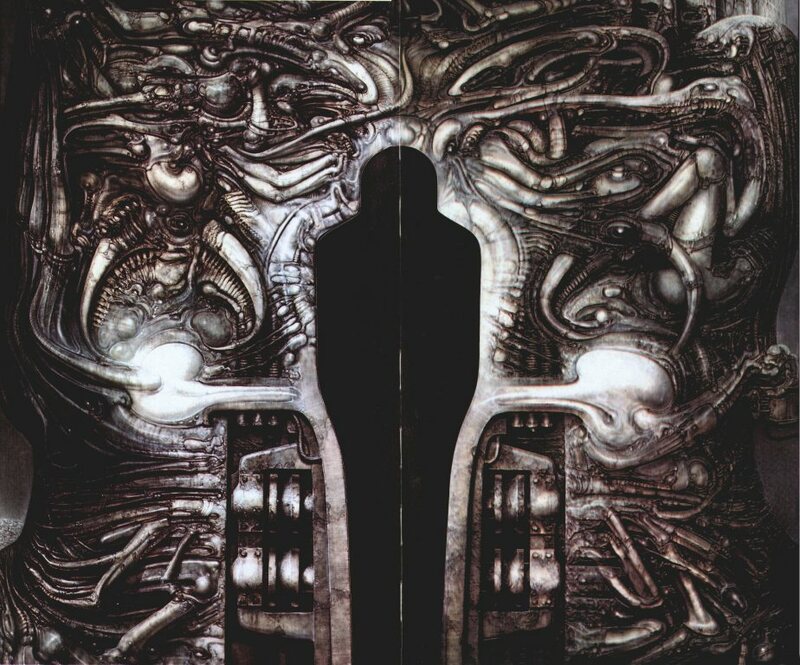 I imagine the beautiful painting of Giger’s. I imagine this kind of nest. it’s slimy, insane disgusting and more interesting than an action scene.” Woodruff otherwise told SFX Magazine: “it’s like an H.R. Giger painting come to life, and it’s enveloping her. It’s going to be a startling moment when you realize how all encompassing the aliens are to Ripley. 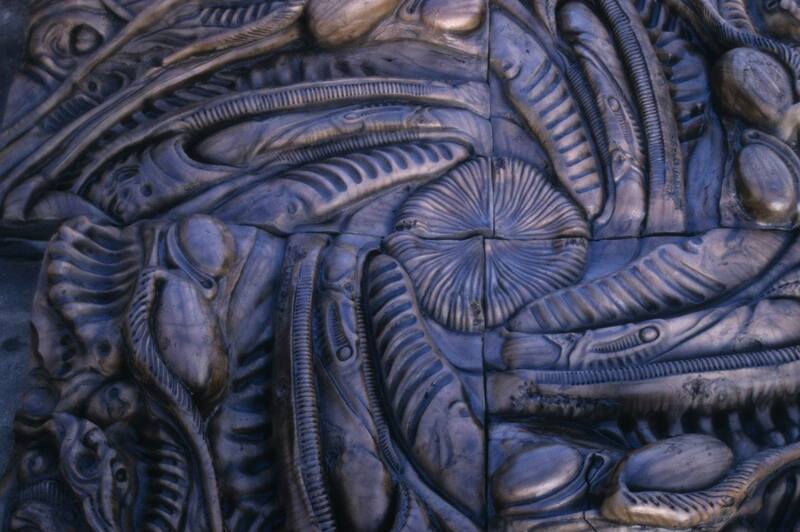 It’s such a literal expression of the Alien all completely engulfing her.” A good portion of the Viper Pit’s structure and textures were based on Giger’s own painting Passagen-Tempel/Eingangspartie, a fact Giger himself pointed out in his second, outraged letter to Twentieth Century Fox — about his exclusion from the film’s credits. The same painting curiously enough had served as the inspiration for the original design of the Facehugger’s underside for the first film. H.R. Giger’s Passagen-Tempel/Eingangspartie, which served as the base for the Viper Pit. “The Viper Pit was important in terms of the story,” Woodruff said, “because it was something that we had never seen before, but it was always in your mind: ‘where would the Aliens take Ripley if they ever got hold of her?’ We knew we had to come across with something that was terrifying. What we ended up with was this large living landscape, a 20 by 20 feet set piece that basically came to life. It contained tentacles and tails of Aliens and a couple of Aliens in suits dragging Ripley through it.” The Viper Pit was built as an enormous, 20 by 20 foot set, with four soft polyfoam mats covered in an outer layer of foam latex. The Viper Pit required 25 to 30 puppeteers to maneuver (with levers) its thick outer layer of foam latex, and various components. A hole in its center (unceremoniously nicknamed “the sphincter”) allowed Weaver to sink beneath. Two performers in suits (Woodruff and Viniello) were also in the scene, among the twisting mass of organs, tendrils and other components. Jeunet had felt that the Eggs in the precedent films had not been lively enough, and so instructed the ADI team to infuse more life into their form. “Early on, Jean Pierre commented to us that he felt that in the past films the Eggs looked a little mechanical,” Gillis said. “He felt that they just opened and that was it. So we took that as a challenge to improve upon the mechanisms of the Eggs. What [gave] the Egg about probably 25 points of movement, as opposed to the four the Eggs had had in the past. That included undulating movement on the edges of the petals so that even if the Egg was sitting still before it came to life you would start to see a little bit of movement, very subtle movement happening. The ‘body’ would squirm and twist.” The opening of the petals was actually devised in three different segments of the petals themselves. The Eggs were also fitted with air bladders, concentrated in an ‘organ’ that could be inflated and twisted. 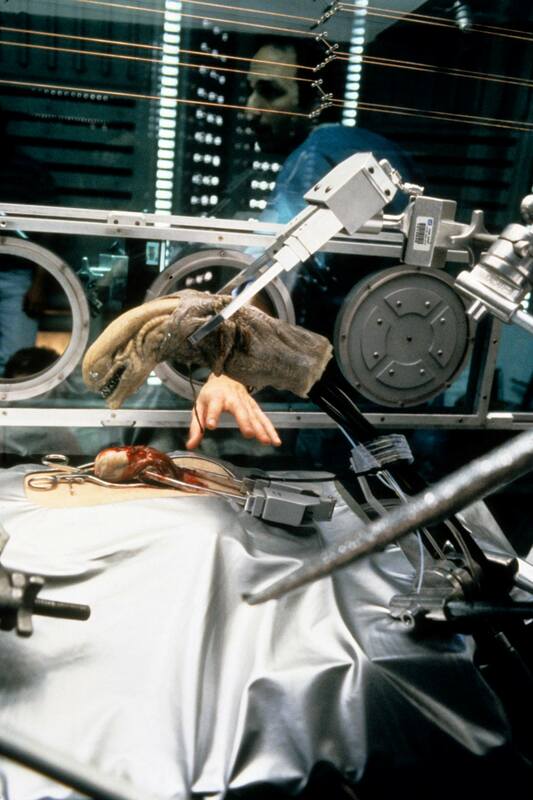 A silicone membrane through which the Facehugger could be glimpsed would split and peel away as the creature emerged. 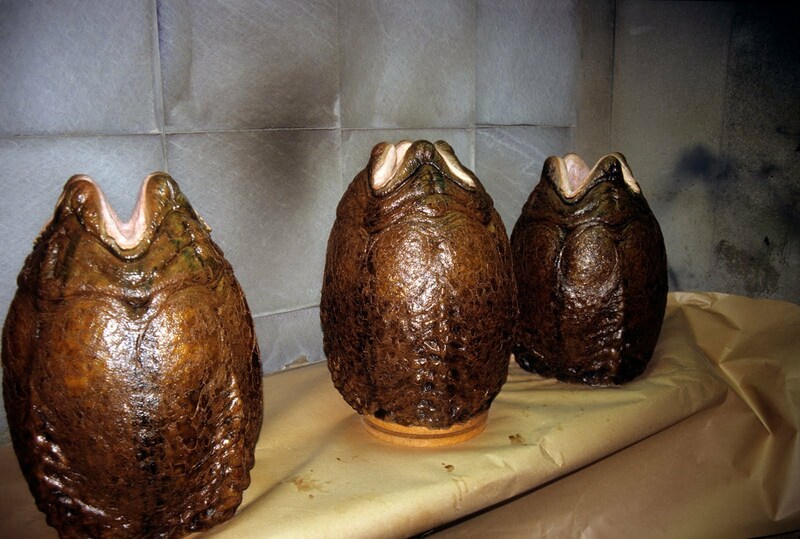 Three versions of the Eggs were built: hero Eggs, stunt Eggs, and partially mechanized Eggs that could house the puppeteers’ arms as they maneuvered the Facehugger hand puppets. The Eggs featured multiple layers of semitransparent silicone to simulate their organic quality. Jeunet was reportedly “absolutely ecstatic” about the final result. The Facehugger design was cosmetically altered, but remained essentially anchored to the estabilished appearence of the creature. Several versions of this stage were built. Cable-maneuvered models were employed when fine finger articulation was needed. For the first time in the series, the Facehuggers were also built as hand puppets — allowing more movement in the body and in the ‘knuckles’ — with mechanical finger extensions. 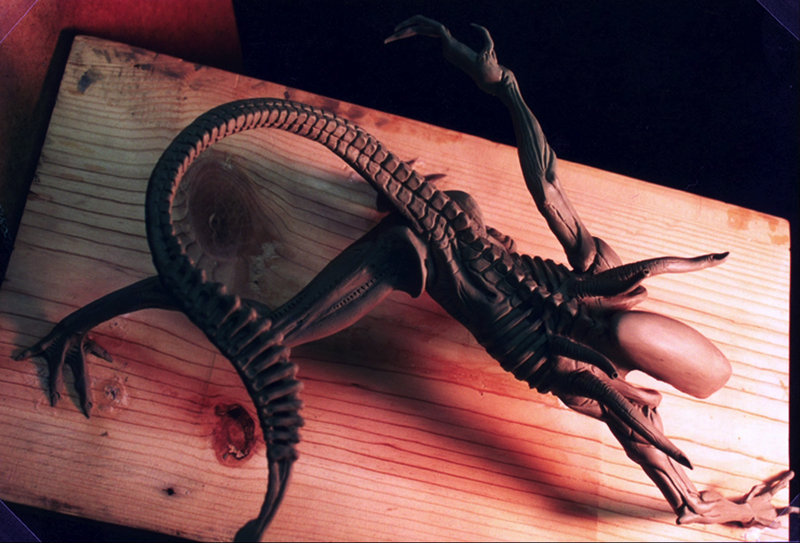 Stunt models were used for scenes where the Facehuggers had to be damaged or explode. In one sequence, a Facehugger attaches itself to Ripley 8; it was filmed in reverse, with the puppet initially positioned on Sigourney Weaver’s face, and then yanked off with a wire. The shot was also digitally enhanced to make the tail wrap around Weaver’s throat realistically. The first Chestburster seen in the film is the immature Queen Chestburster surgically removed from Ripley 8 at the beginning of the film. 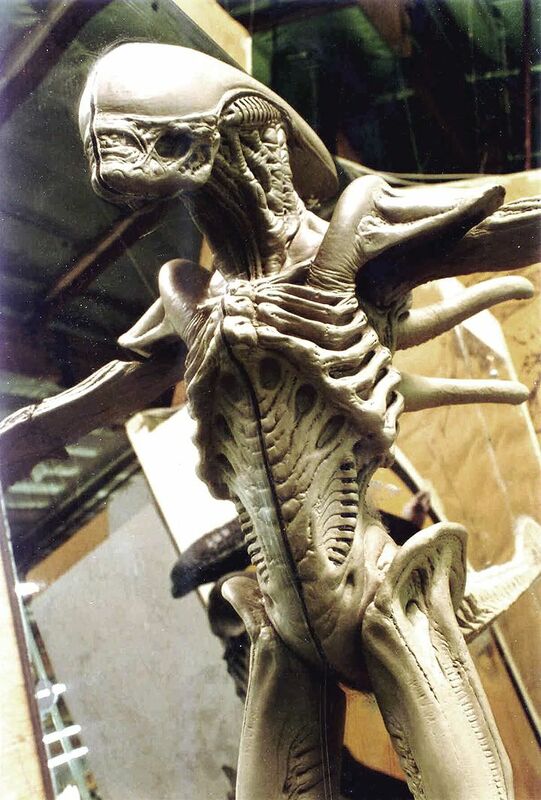 For Alien: Resurrection, the Chestburster design was once again modified; other than cosmetic changes to the head silhouette, the tendons on the sides of the mouth were removed, and the disposition and size of the teeth was changed. For the extraction sequence, a false chest was created in a manner similar to the fake chests built for the previous films. In the set-up, Weaver positioned her body below the table surface with only her head, arms, shoulders and legs visible. Attached to her was a silicone fake chest, which extended from her collarbone to the knees. This prosthetic appliance featured a 5-inch thick layer of simulated bone and tissue, that covered the immature Queen Chestburster. The false chest was rigged to open when the surgical laser passed over it. Silicone tendons and veins are then cut, and the Alien creature (a life-size dummy) is finally extracted — still with a placenta-like sac attached to it. This specific effect was achieved with a thin silicone membrane. 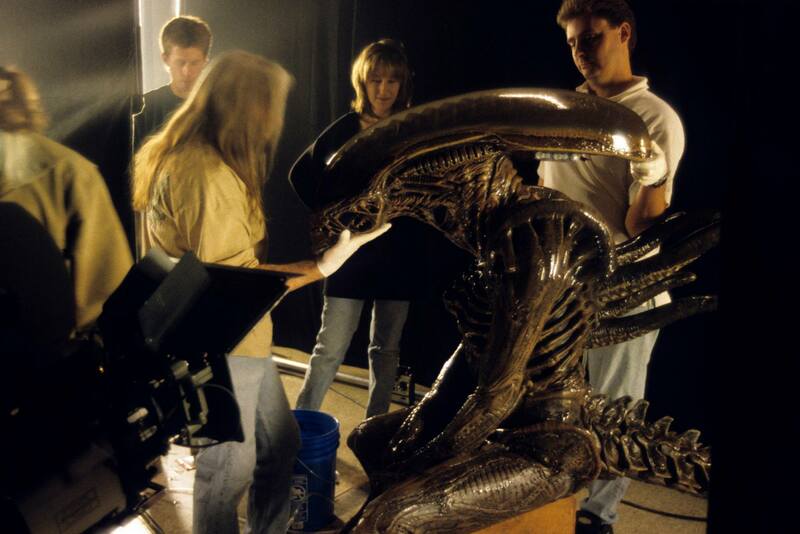 The oversized Queen Chestburster animatronic on set. Following the cut of a cord (or tendon) that connected the creature to Ripley, the monster screeches in pain. In this scene, the Chestburster was portrayed by a larger-than-life scaled animatronic, set in oversized surgical tools matched with its proportions. It was built by Luke Khanlian, and it was cable-maneuvered. Subsequently, the Queen is placed in an incubator. Its feeble movements were achieved with a simple wire attached to the life-size dummy portraying the creature. Another scene involving a Chestburster was when Purvis forces Wren’s head against his chest, making the Chestburster inside him erupt through both his chest and the villain’s head. The Chestburster is first seen in Purvis’ throat — a sequence that used the oversized Chestburster inside a silicone throat, composited with another sequence of the camera entering Purvis’ mouth (which was filmed in reverse). 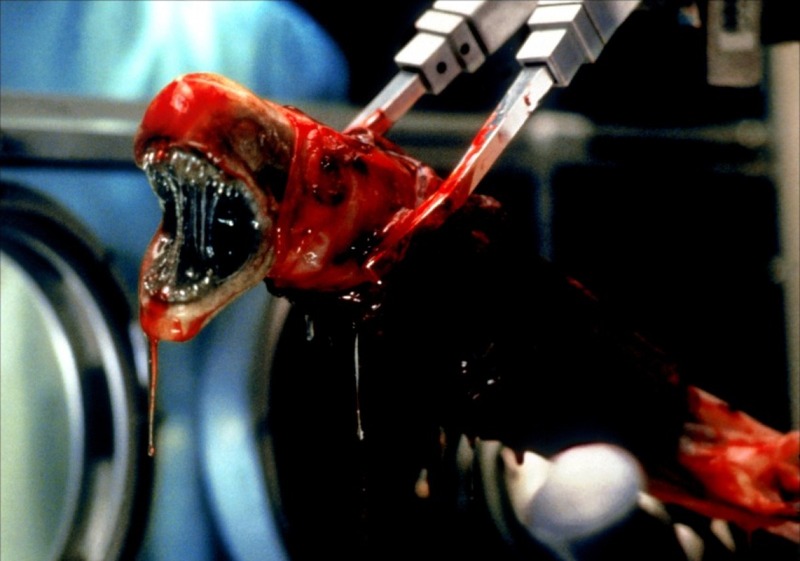 When the Chestburster violently erupts from Wren’s head, the effect was achieved with an animatronic head, filled with a spring-loaded Chestburster, then replaced with a partially mechanized version. Illustration by Sylvain Despretz, based on Cunningham’s concepts. Maquette by Jordu Schell, showing the new tail design. In order to portray the Aliens’ adaptive abilities, the filmmakers decided to show them for the first time swimming underwater. 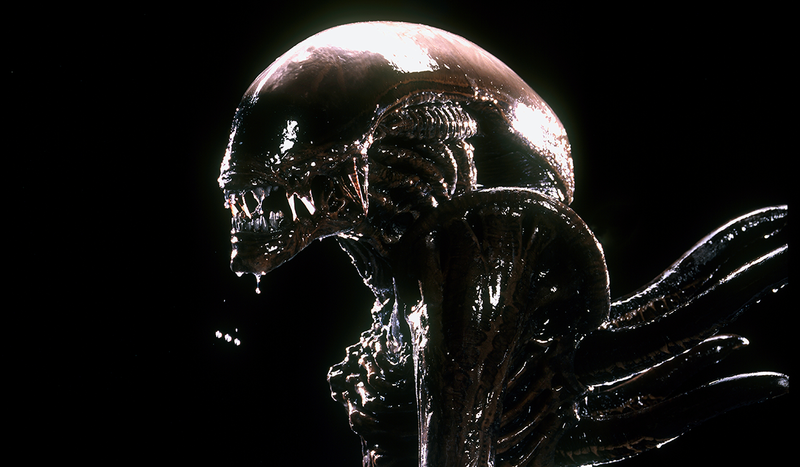 Visual effects supervisor Erik Henry explained: “one of the early things we talked about was — what happens when the Alien [is born] and, you know, they grow up so fast, and they’ve never been in water before? And we wanted to make sure that people realized that these guys were so bad that when they encountered something like a new environment — water being one — they immediately knew what to do. They could breathe underwater; and they [could swim] like experts immediately. There wasn’t any trepidation, ‘is the water cold?’ or anything like that. They had to be real badasses. It’s what the whole series is about.” To portray the new swimming ability, ADI added a laterally-flattened, fin-like extension at the end of the tail. Gillis elaborated: “we let the fact that they swam influence the design of the new Warrior creatures to a degree — so we put a paddle-like blade at the end of the tail.” The new trait was based on a crocodile’s tail. The spines along the vertebrae, down to the tail, were also increased, because first versions of the story featured the Aliens swimming and emerging from the surface — thus exposing said details. Those scenes were, however, removed. 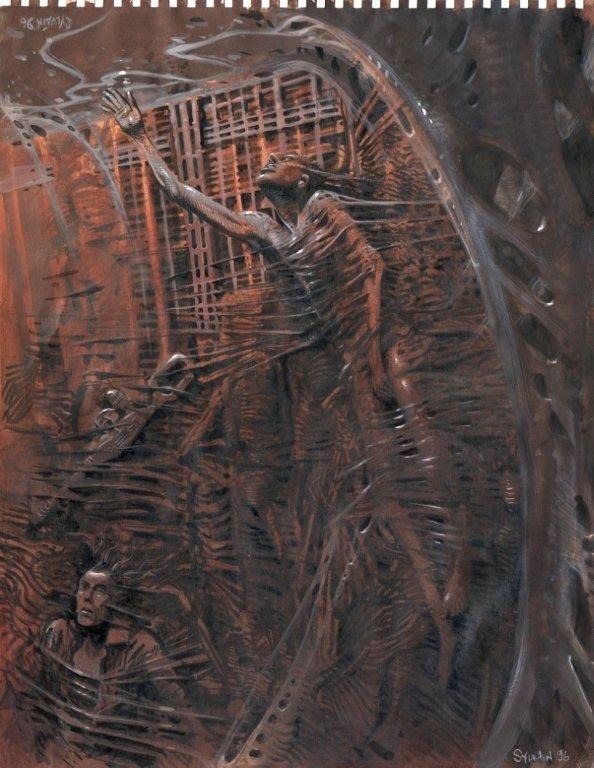 Completing the Aliens was a new colour scheme based on sepia tones, with textures and subtle details based on Giger’s paintings. 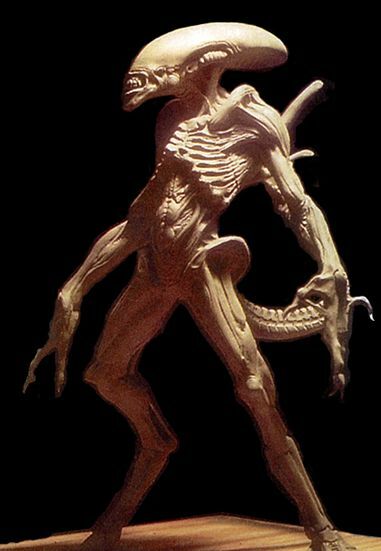 Chris Cunningham’s final creature design was sculpted by Jordu Schell in maquette form. The Aliens were built as a series of practical models, ranging from suits to dummies. The full-size sculptures for the suits were based on the main performer — Woodruff. 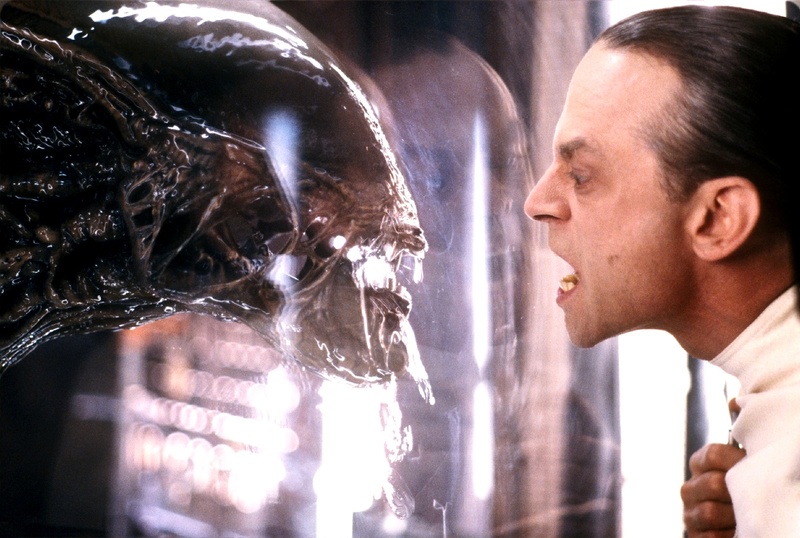 Accompanying him in scenes where more than one Alien was needed onscreen at once were Mark Viniello and David Prior. ADI was able to give the new creature suits several structural improvements: other than new kinds of foam latex and silicone used for the skins, the head’s weight was reduced and more evenly distributed to reduce performer fatigue and allow more fluid movements. 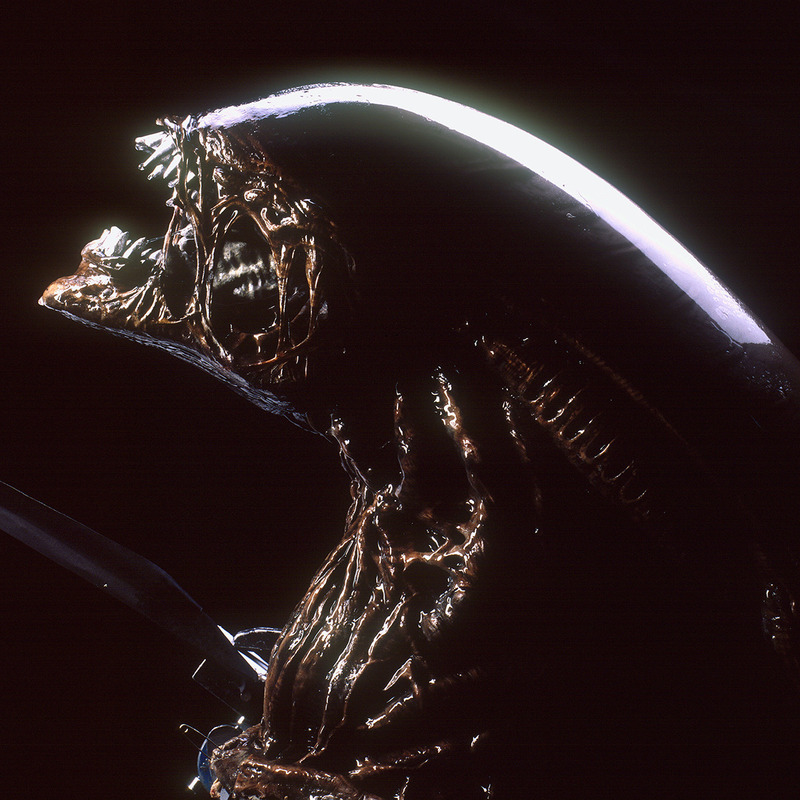 Sculptural detail in the Alien’s neck concealed two eyeholes covered in black screen cloth, allowing the performer to see the surroundings. ALIEN: RESURRECTION, alien monster, 1997. TM and Copyright © 20th Century Fox Film Corp. All rights reserved.. Both stunt versions and articulated versions of the heads and suits were built; the hero heads were either cable-actuated or radio-controlled — the latter were also implemented with pneumatically-controlled ejectable inner jaws (built by John Lundberg). The tongues, at times (such as for Perez’s death sequence), were used in combination with fake skulls and other body portions. Tubes that ran down the back of the suit and out of the tail mount provided both methocel (for the saliva) and dry ice vapour for a visible breath function. The vapour breath “gave it an extra foetid quality,” Gillis said. The hero suits featured cable-operated finger extensions. Separate, insert mechanical hands were also built. 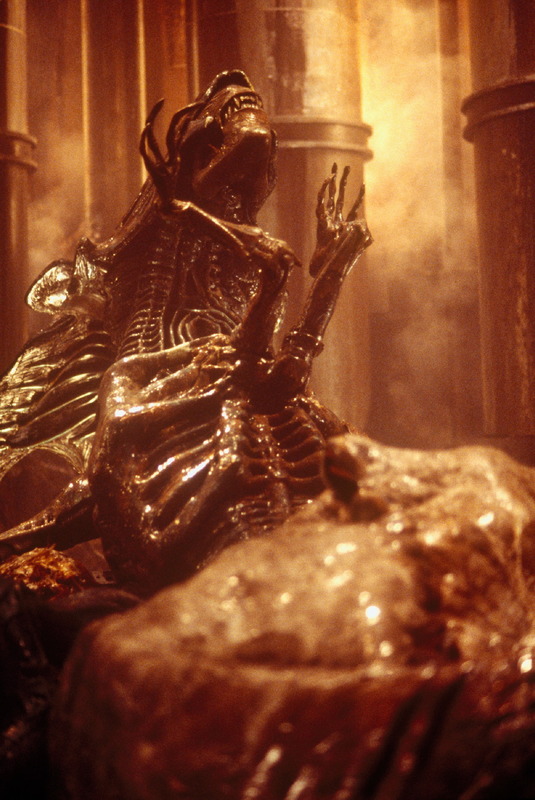 The appendages sprouting from the Alien’s back were animatronic units, able to move independently from each other. 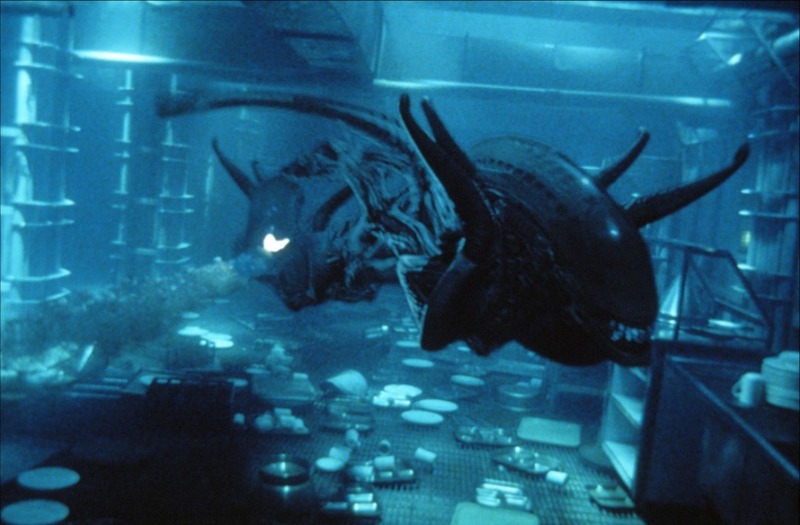 This last feature, mechanized by James Hirahara, was only displayed when one of the Aliens emerges from the water during the chase in the second act. All suits featured harnesses to attach the tails, allowing the weight of the extensions to be carried more comfortably than before. These harnesses were designed for specific types of tails, three of which were made: a tail that emerged straight out of the back (for walking scenes); one that aligned with the spine (for swimming or climbing scenes); a floppy tail maneuverable with wires; and a self-supporting tail devised with laminated polypropylene sheets inside it to support its structure. The last type could also offer a realistic whipping motion with just a swinging motion of the hips — something never seen onscreen. The same tail was also used as an insert model for scenes where it is seen whipping across frame. 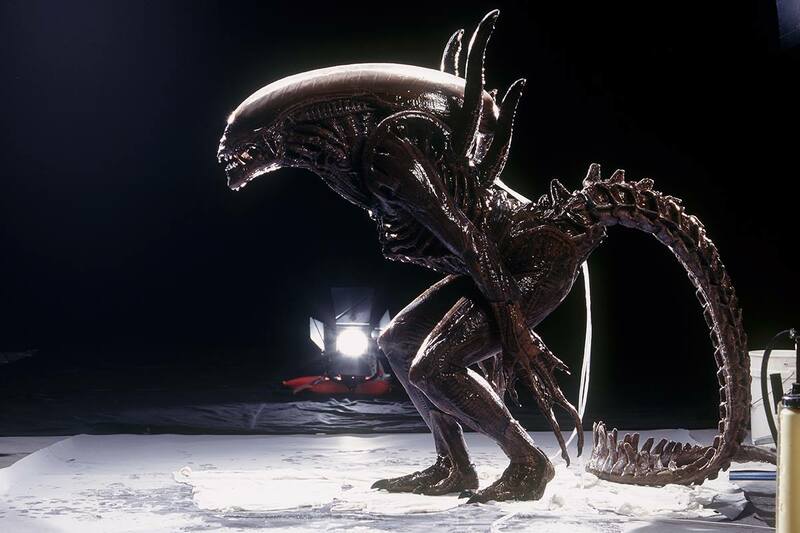 The full Alien suit in a lighting test. Whereas the suits featured no leg extensions — which could not convey the organic movement of the Aliens’ legs given the technological constraints of the time — ADI built several full models of the creatures. Several of them portrayed dead Aliens; one such model portrayed the Alien torn apart by its cage mates — who exploited its acid blood to escape. An elevator device directly under the simulated guts was lowered in order to create the illusion that the acid blood was actually corroding the floor of the cage. In collaboration with All Effects, ADI also constructed wax versions of the Aliens for the underwater sequence, and wax heads and bodies rigged with explosives to portray Aliens hit by bullets or explosives. An additional full-size Alien featured a mechanized tail and could be pulled underwater — with a wire — to simulate the swimming Alien. On set between takes for the underwater sequence. To portray the Alien grabbing Hillard by the ankle and dragging her away, Woodruff was secured to a ratchet mechanism — built by All Effects — and to Kim Flowers’ ankle, allowing the two to be dragged backwards by the mechanism. Woodruff explained: “I was locked off in the cable rig and I couldn’t get out of it quickly, so we put a small bottle of air inside the suit, which would have given me about five minutes, if I needed it — but I never felt in danger. Had things gotten bad, there were enough divers that somebody would have been there to help.” Most of the footage shot with the suit did not live up to expectations in the end, and was replaced with digital shots. 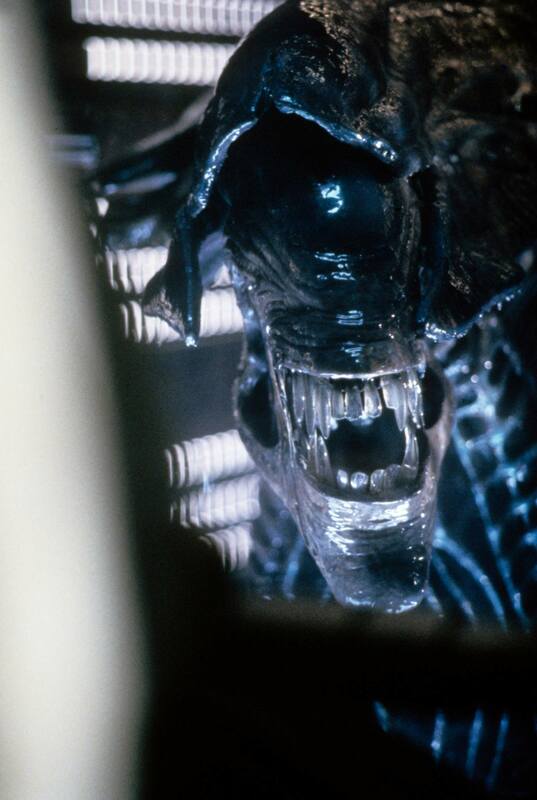 Visual effects supervisor Erik Henry said: “the Alien had many spectacular highlights when shot on stage, and those lent to its eerie and beautiful look; but when we got to it underwater, all of those highlights disappeared, and it tended to look dull. The details suddenly seemed very sculptural and the colours washed out. Water just wasn’t very flattering to the character.” Only a limited number of shots with the suit survived the final cut of the film. 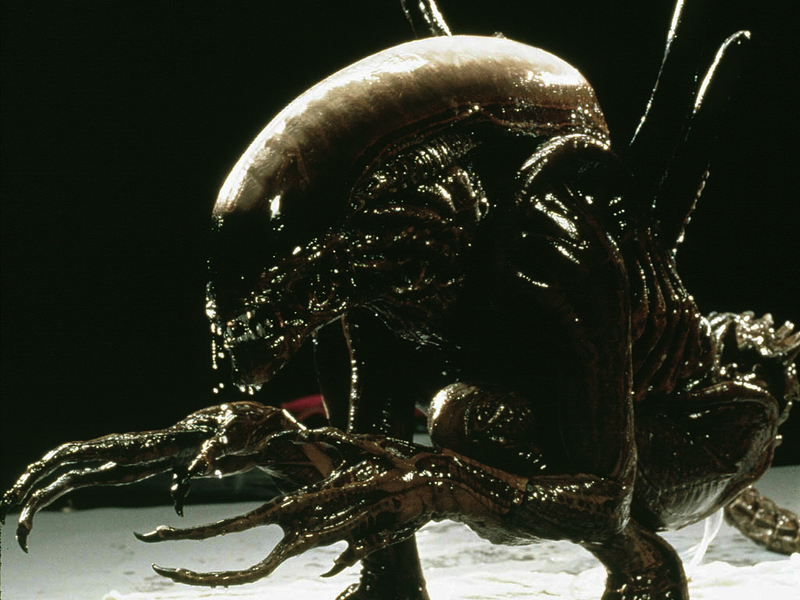 For the first time in the Alien series, in fact, digital models were used to portray the Aliens in certain sequences. Blue Sky Studio was chosen for the digital creature effects, based on their work on Joe’s Apartment — for which they had provided the film’s dancing cockroaches. 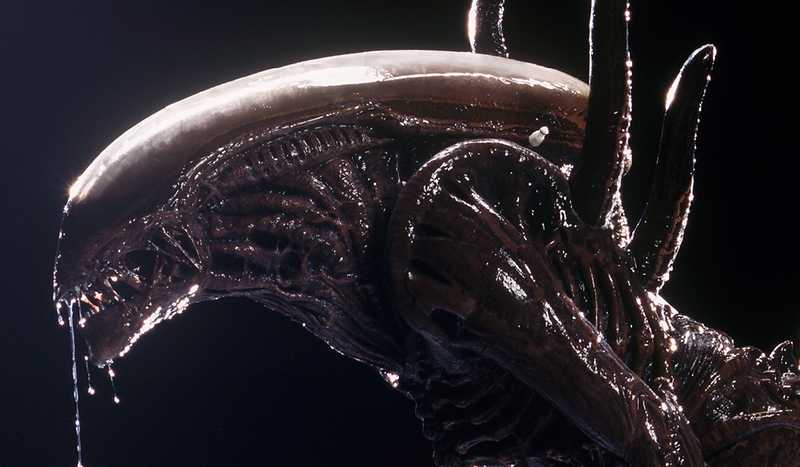 Kerry Shea, visual effects coordinator, explained to VFX HQ: “we were looking for Alien effects that were sort of insect-like, and [Blue Sky] had done such a terrific job on the cockroaches in that film.” Reference material from ADI was used to build the digital Alien model. Full-size castings of the head and tail were provided and scanned. Technological constraints of the time only allowed them to be 3D templates for the digital model, due to their sheer level of detail. For the rest of the body, a half-scale painted casting of the left side of it — sculpted by Steve Wang –was provided by ADI, and simply used as reference. The digital model was, in fact, built from scratch by modelers Mike DeFeo, Shaun Cusick, and Alexander Levenson. Once the model was constructed, painters texture-mapped the colours in the ADI reference sheet onto the model, degrading them to match the worn appearence of the suit in the live-action footage. Sculpting the reference maquette for the CGI team. Animators Steve Talkowski, James Bresnahan, Doug Dooley, Nina Bafaro and Jesse Sugarman developed walk and swim cycles, also determining the movements of the skeleton and the muscular contractions under different conditions and in different movements. 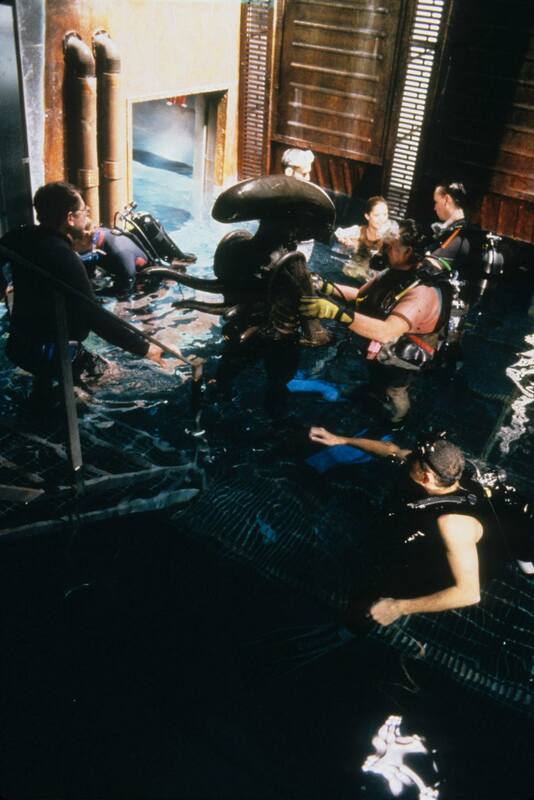 Renderings of the digital Aliens were achieved with suitable resolutions for each shot — with the most ‘data-intensive’ being the scenes set underwater and in close-up. Visual effects supervisor Mitch Kopelman said to Cinefex: “the high-res model that we had was about 85 megabytes of data, which was the most complex and detailed model that we’ve ever made. On top of that, the close-up model required something on the order of 300 megabytes of texture maps. Fortunately, the majority of the shots were a little more reasonable, so we could do them fairly economically, without sacrificing image quality.” According to Kopelman, the Aliens were the most complex digital creatures Blue Sky had to create up until that time. Rhett Benatt, David Esneault and Thane Hawkins were among the compositing and lighting technicians. 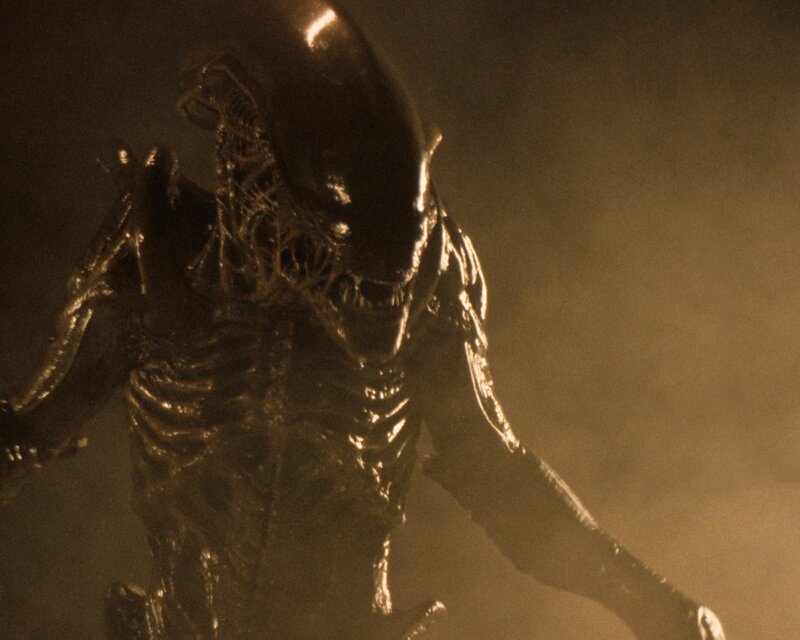 Digital Aliens were used both on land and underwater — with the latter being the most complex shots to achieve. Kopelman explained: “the underwater stuff presented a unique challenge to us. There were a lot of issues we had to deal with, such as the interaction of the Alien with various set pieces. We used volumetric lighting techniques for shadow effects. There was also the effect of caustic reflections from the rippling water surface creating little strands of light cascading across objects below.” In order for the Aliens to be inserted convincingly into the environment, air bubbles had to be composited into the shot and interact realistically with the swimming Aliens. Different layers of digital bubbles were created to interact with the Warriors coming towards the camera, in order to maintain a correct depth relation. 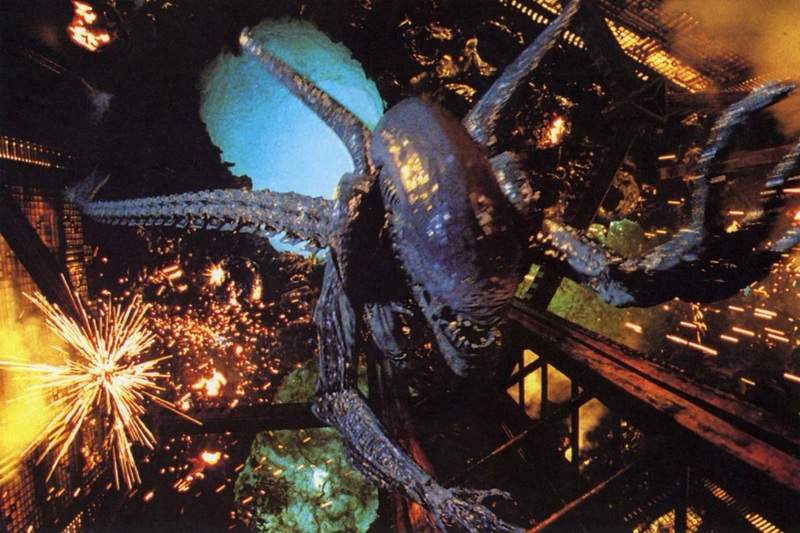 For the scene where one of the Aliens is actually hit by Johner’s weapon, “we set up a black, wax Alien that was blown up underwater by the special effects team led by Eric Allard — it was rigged to blow up just as the little grenade that was wired and aimed directly at the wax Alien hit the creature,” Henry explained. “We also shot a clean background plate of the underwater set and of course, the animation elements provided by Blue Sky.” The number of underwater shots was also increased when footage of the practical suit was mostly deemed unsatisfying. Techniques to help conceal the digital nature of the Aliens included adding multiple atmosphere layers, as well as increasing the number of bubbles to certain shots. 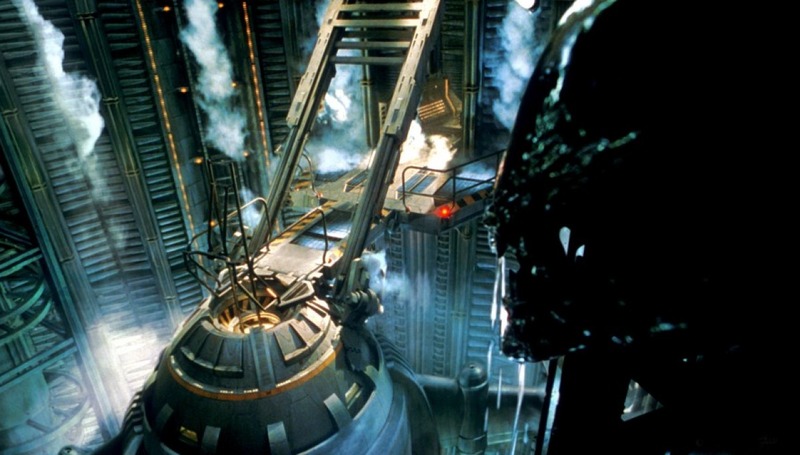 When the Alien chasing the survivors violently bursts from the water and grasps the ladder, the original plate was shot with a full-size black Alien dummy with cables, launched with a pneumatic ratchet and pulleys. The dummy was then replaced with its digital counterpart, animated by John Siczewicz. 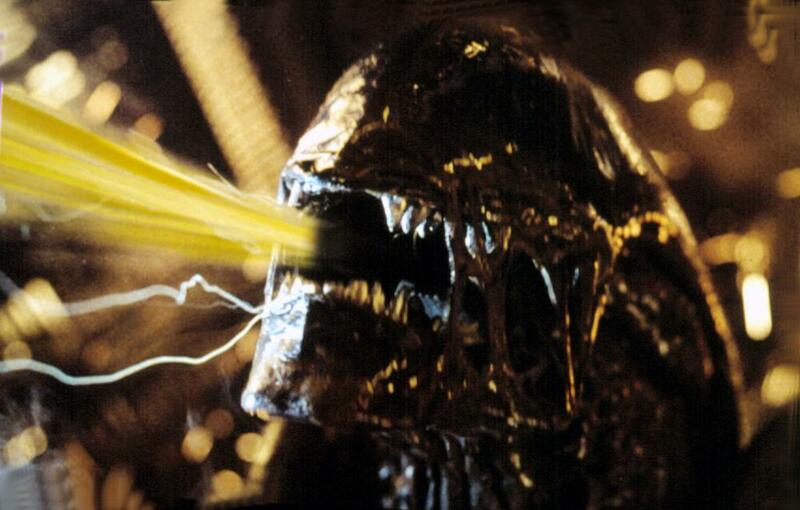 Digital Alien acid spit was also employed after practical tests at ADI were deemed unsatisfying. 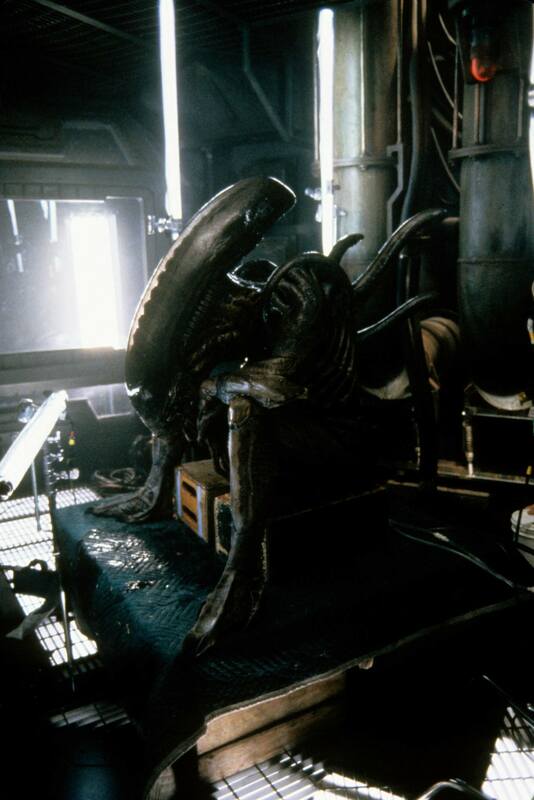 The team had found some of the original moulds of the Aliens Queen, which had actually been thrown away in a storage bin, whilst making the effects for Alien³. By the time of Resurrection, however, they were in almost unusable conditions. “The moulds had literally been thrown into a huge steel bin,” Woodruff said. “They were silicone rubber with a fiberglass jacket, and the silicone and fiberglass were shredded to pieces. I believe what happened was that somebody wanted an Alien Queen for themselves and had pulled a fiberglass copy, and the remaining pieces were shipped to Distortions, a company in Colorado that was manufacturing big polyfoam versions for people to buy. That’s where we tracked the moulds down, and we paid to have them shipped to us here in Los Angeles, but they were useless. There was little of them left that could even be pieced together.” Most of the Queen’s body had to be resculpted starting from what could be cast from them; as such, it appears cosmetically altered. For example, the hands of the inner arms have two opposable thumbs each — a trait which was present in the miniature models built for Aliens, but carefully hidden in order not to conflict with the full-size Queen, which only had one opposable thumb on each hand of the inner arms. 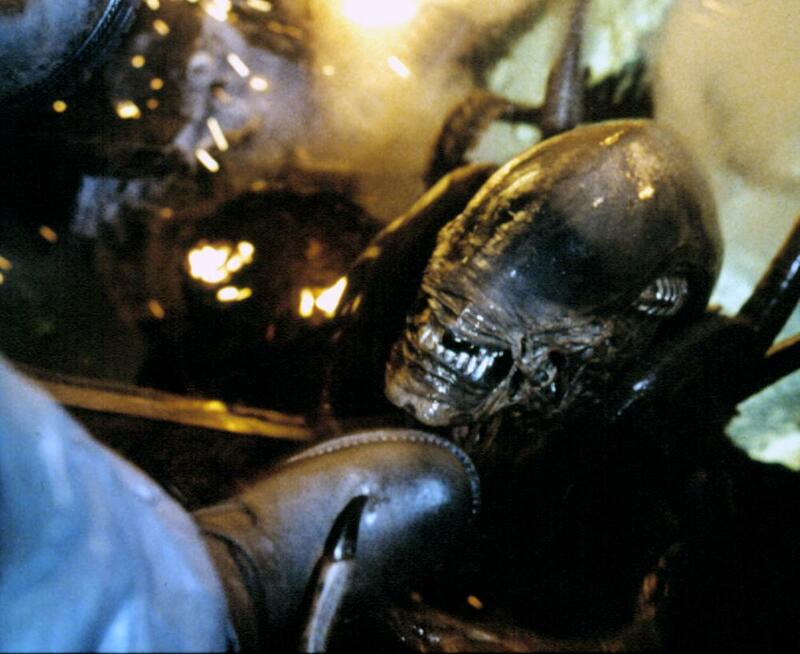 Fortunately enough for ADI, whereas the original body could not be retrieved, the head of the Aliens Queen had actually been salvaged in Bob Burns’ collection of film memorabilia — along with a number of other moulds. Woodruff recalled: “we got the head from Bob and gave it a new, detailed paint job, refabricated a body and did new sculptures for the body and neck. We also used some moulds that we found which were still intact. Had it not been for Bob Burns, though, there would not have been a Queen in the movie, because there wouldn’t have been enough time to get it done.” The new colour scheme, which included sepia tones and a light fogging of pearlescent blue, was devised and applied by Dan Brodzik and Mike Larrabee. 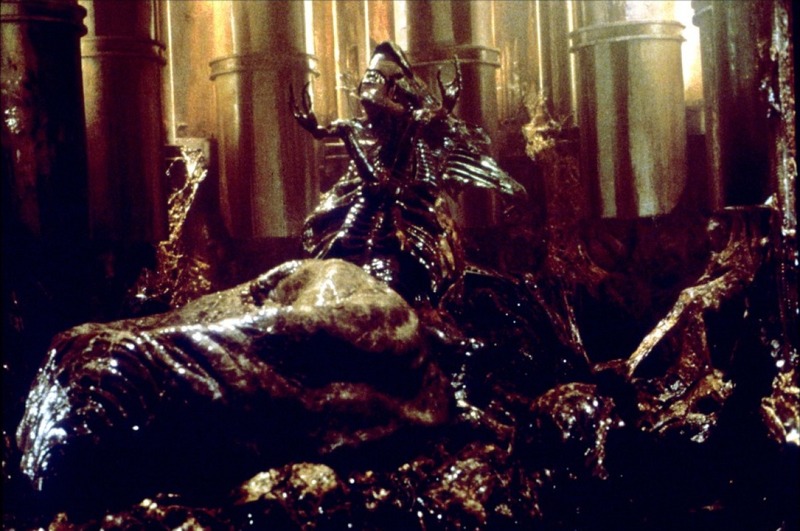 Unlike the Aliens Queen, however, the Resurrection Queen would be a fully animatronic character, positioned on an elevated set. Mechanized by Luke Khanlian, the creature was powered by extensive hydraulic mechanisms. Aquadraulics — which employ water instead of hydraulic oil — were used for certain parts of the body, such as the neck and head. Limbs and other components were cable-maneuvered. 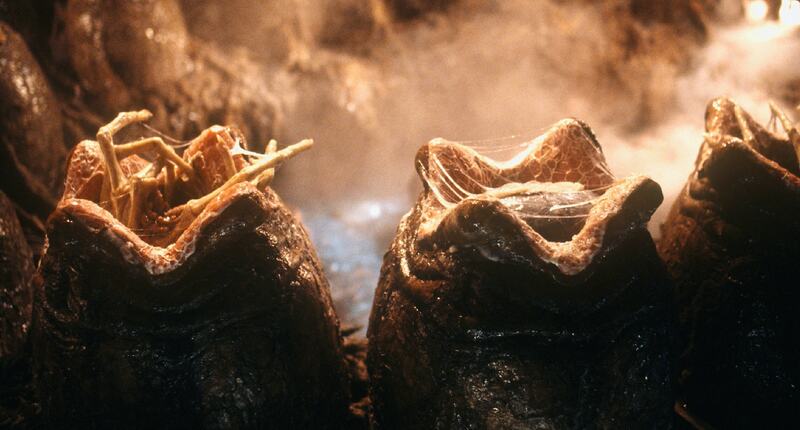 Tubes running to the head were used to pump slime and dry ice vapour in the same manner as the other Aliens. For more images of the Aliens, visit the Monster Gallery. For a look at the failed Ripley clones and the Newborn, visit the article: Aberrations of the Auriga [COMING SOON]. Posted on 07/08/2015, in Movie Monsters and tagged Alien, Alien: Resurrection, Amalgamated Dynamics, H.R. 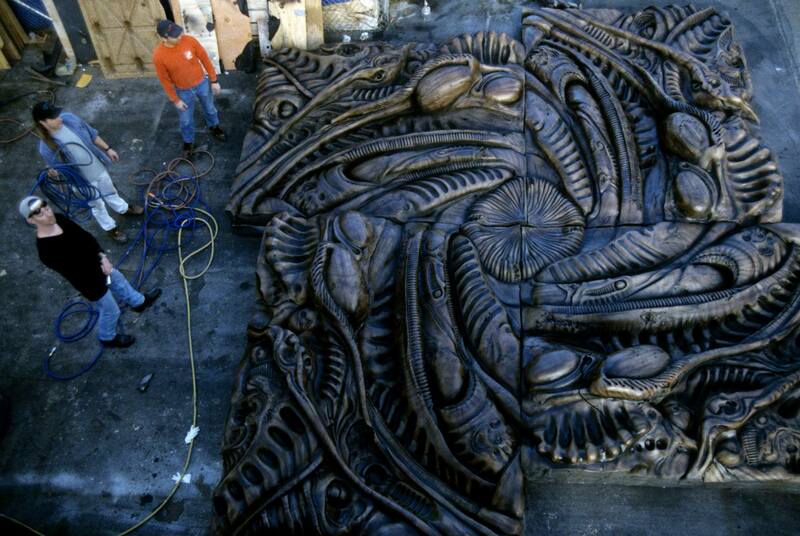 Giger. Bookmark the permalink. 1 Comment.